We pulled up the RV jacks and made the long trek to Florida. Along the way, we stopped in multiple places, sort of a last RV trip hurrah to see our friends and family that live all over the U.S. When we arrived in Fort Lauderdale, we almost immediately found a catamaran that we liked, so we put an offer on it. Soon after that, the dealership where we bought our Tiffin Allegro Bus made us an offer on our RV for almost what we originally paid for it, which made it a no brainer to sell it back to them. While we were waiting to close on our boat, we moved into an Airbnb for about two weeks. We bought our 2018 Lagoon 42 from The Catamaran Company in Fort Lauderdale, Florida. We spent a few weeks making some changes and additions to the boat, as well as testing everything before we sailed away. Our first adventure living on a sailboat was to sail from where we bought our sailboat, at The Catamaran Company in Fort Lauderdale, to the other side of Florida in St. Petersburg, where we’re currently docked. We have a lot to learn, and that's part of the reason for why we're so excited to be living on a sailboat. We know that we're newbies, but that just makes growing and learning so much fun! Today, I want to answer some common questions I've received about living on a sailboat. If you are thinking about living on a sailboat someday, hopefully this will help. Also, if you’re just curious how we are making it work so far, here are answers to questions from you, my readers. 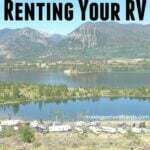 Common Full Time RVing Questions Part 2 – Don’t You Hate Each Other Yet? One of our last campsites in our RV. Yes, we miss RVing. We enjoyed RVing a TON, and I know that we will do it again one day. This may sound crazy, but RVing was very easy for us, living on a sailboat and learning to sail definitely is not, haha. We miss how easy RVing was, that is for sure. We definitely fell into a routine with RVing, which made it even simpler. We know that, eventually, sailing will be the same. We loved that RVing brought us to so many beautiful places, allowed us to park our home right next to amazing hiking and biking trails, gave us the ability to travel very comfortably, that we could bring our dogs everywhere with us, and more. 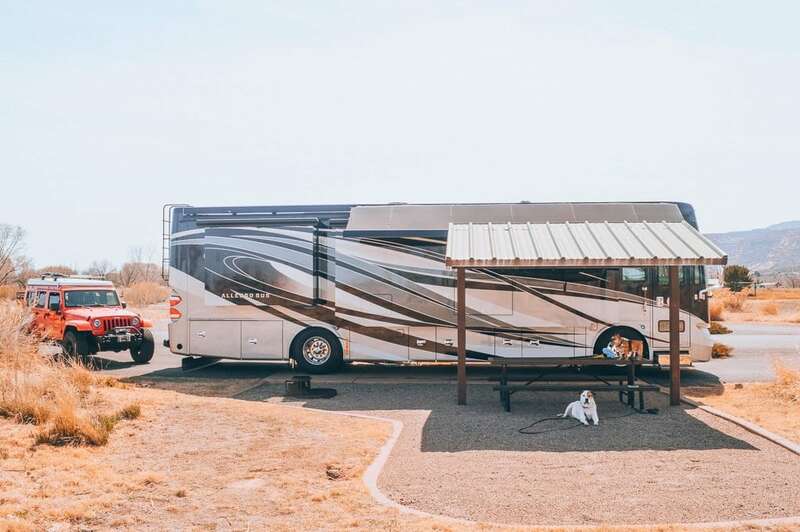 People often asked me, “what’s the hardest part about RVing?” and “what do you hate about RVing?” Those were always hard questions to answer, because, honestly, there was nothing bad about it. RVing was a wonderful experience, and I know that we’ll do it again one day. But, here’s to new adventures! Side note: Make sure you're following me on Instagram! Are the dogs going to live on the boat? For some reason, some of you think that we just gave our dogs away. Haha, that simply isn’t true! The dogs came with us in the RV, and if we’re living on a sailboat, then they are living on one too. The dogs are doing well and adjusting to boat life. We are taking it slow with them, since they are older and didn’t grow up on a boat. The top tip we’ve heard from other people with boat dogs is to start slow. Numerous people have suggested starting them out at a marina, then doing day sails, and go from there. So, that’s exactly what we’re doing! They’re also getting on and off the boat just fine. We just pick them up and have a nice harness for Sailor that works great for this type of thing. Also, we chose a marina that has a ton of grass, which means they still get in plenty of walks. Eventually, we will leave this marina (we’re doing just short sails for now), but for now, we have a never ending list of boat things to do in order to prepare! 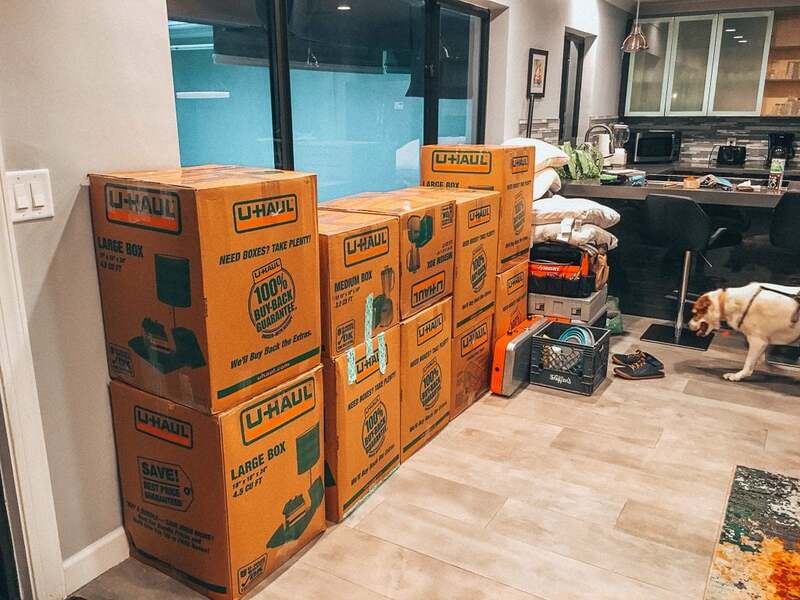 Everything we own from the RV. What do you have on your Lagoon 42 sailing catamaran? 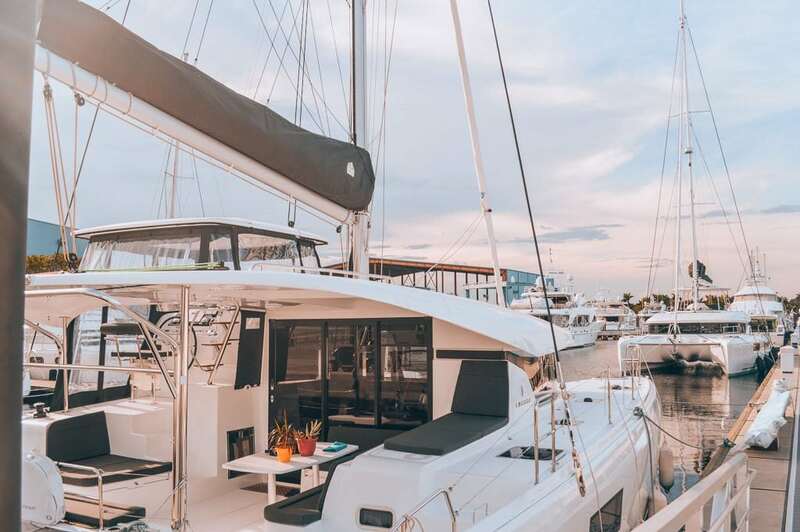 Our Lagoon 42 sailing catamaran is just like a “normal” home. And, because I know I will get a ton of questions about it, yes, I can shower and use the bathroom on our sailboat, haha. Wes, my husband, crewed a delivery of a new Lagoon 450 from France to Croatia, which is about 2,700 nautical miles. 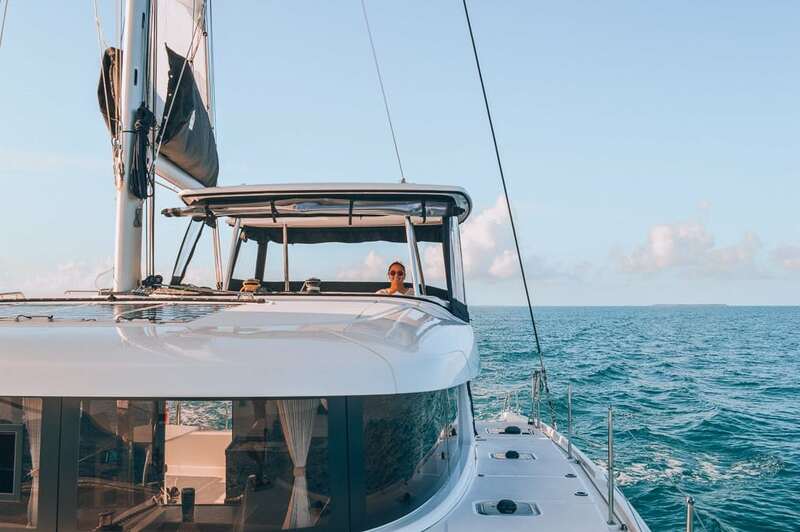 At first, we thought we were interested in the Lagoon 450, but we decided that was just a tad too big for us, so we decided to go for the Lagoon 42. On our sail from Fort Lauderdale to St. Pete. This is near Key West. What have you added to your sailing catamaran? We added a few things before we left Fort Lauderdale for St. Petersburg, FL. Our plan is to add more items once we have been living on a sailboat for a few months and really know what we want. Also, I should note that we had all of our additions completed by MultiTech Marine Services. Henry Saludes of MultiTech Marine Services was amazing to us, and we are so grateful. He helped us a ton as new cruisers. He helped us create a maintenance checklist, went over anything and everything we needed to know about living on a sailboat (we had so many questions, haha! ), and we feel that a great friendship was formed. Every employee that we came across was great! We knew them all by name, they kept our boat clean even though it was a working yard, they showed us how to use the systems they installed, etc. I highly recommend Multitech Marine Services, and I know that we will be back in the future. We really felt that they went above and beyond and treated us well. Thank you Multitech for making the transition to living on a sailboat easy for us! And more. The list is neverending! This is where we were docked right after we purchased the boat. What are your sailing plans? 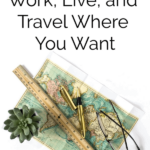 As full-time travelers, we don't live by a specific schedule, and that's because things can change fast. One thing we learned from RVing is that it's hard to plan even a month out, let alone years. Our plan right now, which will probably change, includes spending the next few months learning our boat, getting our dogs used to it, outfitting it more, and doing short sails out from our marina in St. Petersburg, Florida. Then, we hope to hop over to the Bahamas in the winter, and to the northeast U.S. next summer. After that, we have dreams of further exploring the Caribbean, Europe, and the Pacific. Note: We are taking things slow for now. We spent most of June and part of July taking sailing, docking, and safety lessons. If you're looking for a great instructor and/or someone to help move your boat, I highly recommend Captain Jeff Lewis. He helped us move our boat from Fort Lauderdale to St. Pete, and he also taught us how to dock (as well as much more!). He is an amazing teacher, and, no, he did not pay me to write this glowing review. He is a great teacher! How much does living on a sailboat cost? And, boy, has that been true so far. But, we are super excited! I'll be revisiting this section once we have spent more time living on a sailboat, but, for now, our costs are our Lagoon 42 sailing catamaran, the marina, any additions we add, fuel, sailing instructors, and so on. You can read a little more about sailing costs in an interview I recently did – From Backpacker Working For $3 An Hour To Sailor With An Online Business. Why haven't you sailed to ______ yet? So many of you have asked why we aren’t halfway around the world yet in the Pacific Islands or somewhere in the Mediterranean. That makes me chuckle because there are lots of boat things to do and starting slow is normal. When you first get a boat, the average person spends a decent amount of time preparing it and themselves for the cruising lifestyle. Some people spend years and even decades preparing and outfitting their boat. Getting a boat ready to cruise is no easy feat. Plus, we’re not in a rush! 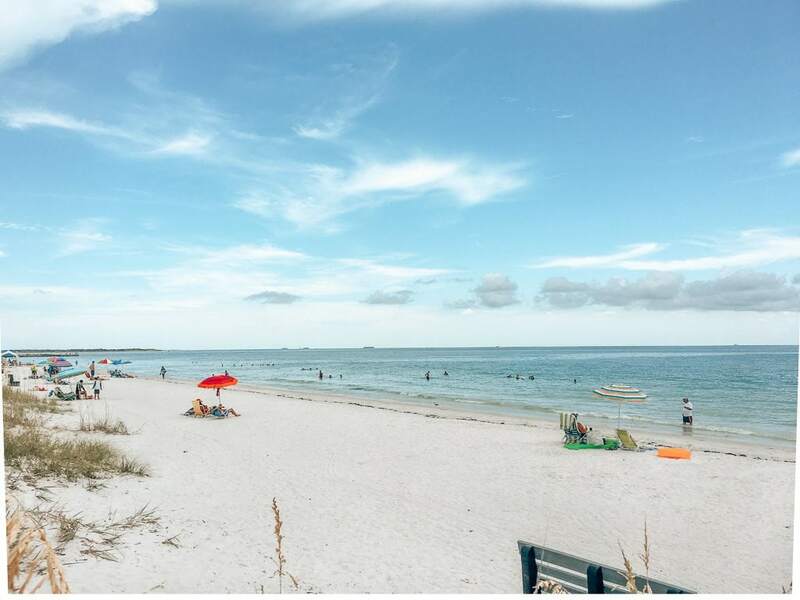 A beautiful beach in St. Pete. Will you ever touch land again? A lot of you have asked if I’ll just be floating out in the ocean and if I’ll ever touch land again. Sailing is sort of like living in an RV. You don’t just spend 24 hours a day, 7 days a week driving. And, the same goes for sailing and cruising. We will sail and/or motor from destination to destination, but we will, of course, be staying at marinas and anchorages too. We plan on exploring the water around us, as well as the new cities and countries that we sail to! What are you going to do for internet? We currently have AT&T for our phones and internet. We used to have both Verizon and AT&T, but we recently switched to just AT&T and have been really happy with it. Even with that being said, sometimes our internet connection is not that great. This means I always try to work ahead as much as I can so that internet does not create any stress. When we leave the U.S., we will have to figure something else out for internet, but I’m not worried about it because there are always options. 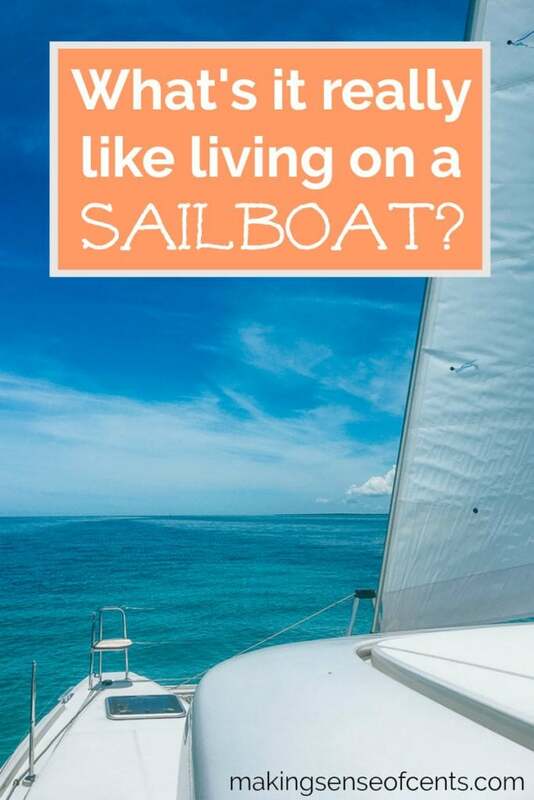 What are you doing for health insurance since you'll be living on a sailboat? When we started taking RV life seriously, we found out that we had no realistic health insurance options. I didn't want to pay the penalty for not having health insurance, and I also didn't want to go uninsured. 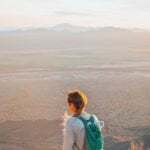 For full-time travelers, it is difficult to find health insurance companies that will cover you. Some health insurance companies won't cover you once you travel out of your state. If they do offer out-of-state coverage, they usually require that you at least live full time in your home state. While we do have a home state and address, it isn’t technically where we live full time. So, it was important to find a health insurance provider that wouldn’t possibly void a medical expense if they found out that we were trying to get around this loophole. Plus, the only policy that we qualified for (in our state) had an astonishing deductible of $39,000 for out-of-state medical expenses. And, as full-time travelers, we are excluded from the majority of policies anyways, due to the loophole described above, so that just didn't work for us. Paying a high monthly health insurance premium that comes with a $39,000 annual deductible, and the fact that many of our claims would probably be voided, made our decision to go with a health sharing company an easy decision. So, in January of 2016, we started a membership with Liberty HealthShare. For the both of us, we pay just $249 each month. With this monthly fee, 100% of our eligible medical bills, up to $1,000,000 per incident, are covered after the $1,000 per couple annual unshared amount (think of this as your annual deductible). They are under no requirement to cover your medical expenses. You cannot deduct Liberty's monthly costs from your business taxes. You cannot contribute to a Health Savings Account. Pre-existing medical conditions are not covered until years later. Health care sharing ministries all have some sort of ethical rules that you must abide by, such as no smoking, no drinking, and so on. If you incur a medical expense due to something that is against their policies, there is a chance that they will not cover it. You can read more about Liberty HealthShare at We No Longer Have Traditional Health Insurance – Liberty HealthShare Review. What are you doing with the Jeep? We sold the RV, but we are keeping our Jeep. 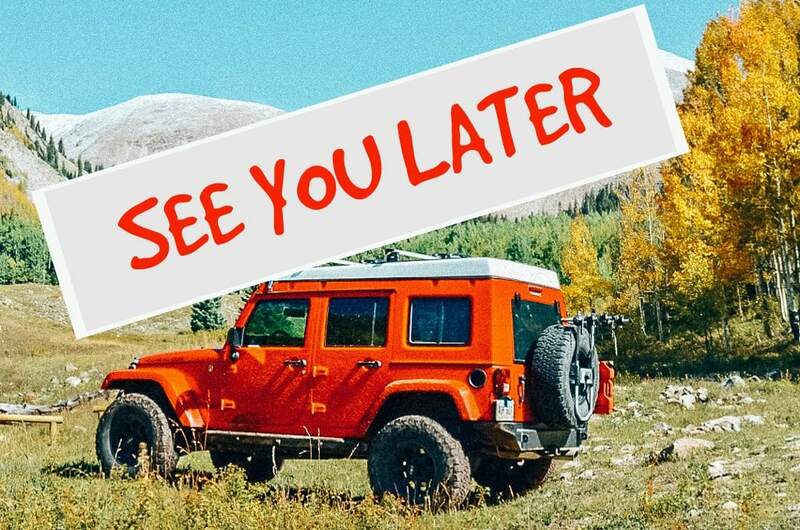 We've spent a lot of time and money turning our Jeep into an overland vehicle, and we are just way too attached to it to get rid of it. Plus, it's a great vehicle to use when we want to explore via car, as it has a camper top and everything else we would want in order to camp somewhere. For now, we are keeping it at Wes' parents’ house and having them drive it. How do you receive mail? We belong to a mail forwarding company called My Dakota Address. All of our mail gets sent there, and they then forward our mail to wherever we are. We are in the middle of the process of switching to a different mail forwarding company, St. Brendan’s Isle. Who are your favorite sailing blogs? Funny enough, I never really watched any RVing videos, but I am completely addicted to sailing Youtube channels and blogs. There are so many others to list too! What other questions do you have for me about living on a sailboat? I would like to know if you got your boat new or used and how did you finance it? What an odd comment pepe. Clearly, something has triggered you with this topic, haha. Hey Melody! We bought our boat new. You can finance boats just like RVs/homes/cars. Not the exact same, but similar. Or, you can pay cash, of course. This was an awesome post Michelle. We love following your adventures so it’s great to read how it’s going. So excited I have finally got Brittany talking about full-time RVing 😊. Wow, so amazing.Your boat seems incredible. My friend has a small sailboat and he jokes about the “bust out another thousand” thing as well. But once you have it tuned it it’ll be amazing. You have incredible adventures coming up for sure! Wow, Michelle — what a post! It sounds like sailing life suits y’all 🙂 I know how much prep it takes to just get out the door and onto our family boat, and how long it takes just to do a simple spray-down afterward; I just can’t even imagine all of the little (and big!) things it takes to keep your catamaran running smoothly. In awe of you guys, and wish you happy sailing! There’s definitely a lot of work! Living in a sailboat is a misnomer and a fallacy right up there with BS! I was on a sailboat, I occupied the sailboat and I slept on that sailboat but I can not say that it was living. Costly-expensive and labor-intensive, confined to very small spaces, unhealthy eating, and living, uncomfortable in every way possible, romantic at first and then reality, inconvenient in every way possible, lots of thieves living in run-down derelict boats, I never saw so many trashy-poor people living in the back of the bay in run-down garbage. Fuel is expensive, repairs and labor are very expensive, parts are very expensive, and it cost to get your septic tank empty and your neighbor docked next to you could blow up and take you with him, it almost happened to me. The cost of docking is constantly going up, I was paying 10-20 dollars a foot and at times even higher, my boat was a 55 footer so that was $550/mo minimum, plus electricity and other fees that they will charge you, like dinghy dock fees and so on. Some include it all in a package with laundry, showers, dinghy dock, etc. A vacation on a sailboat is one thing and it is enjoyable, living on a boat, any boat, permanently? Never again! Unless…you have a 100 footer, millions, and a paid captain and crew. So, just because you didn’t enjoy it means that everyone else is lying? Michelle, good for you!! I’m thrilled for you! I’ve known cruisers and they’ve loved the experiences. What first came to mind was…what about your dogs? You answered it quickly above. Enjoyed your article here :). Congratulations and how exciting for you guys! I continue to follow and be inspired by your blog! Down the road, make sure you hit up a sailing trek around the British Virgin Islands. So much to do and see. Truly a group of islands that caters to the sailing crowd! Sailed in 2016 around the BVIs and can’t wait to go back. Safe sailing! We are hoping to bring our own boat there eventually too! Love it. The boat is beautiful! Absolutely amazing! Love the boat and that carefree living lifestyle does sound like paradise. Never even thought about some of the issues you face as a full time sailboat owner. Shocking about the other alternatives for health care for instance (and never even considered complications with mailing etc (you have some pretty savvy questions from readers). Did you ever think about chartering a sailboat for x amount of months and RV the other amount to keep the best of both worlds? Excellent post, and thanks for the shout-out to Capt. Jeff Lewis and On Watch Yacht Delivery! How do you decide what food/how much to bring with you on longer sails since produce doesn’t last very long, how do you sub out your diet/food groups to accommodate the change for both you and the fur babies(dogs)? We haven’t gone on any super long sails yet. Our longest was provisioning for 10 days and that was fine. Ah! I love you stuff, and have been following for a while. Have to say, RVing never really appealed to me, but I’m head over heels excited to see where your sailing adventure leads! Best of luck!! and hope the puppers do great, too! This was so fun to read! I didn’t realize our boats are basically the same length – ours is 41′, 47′ overall with a bowsprit, but yours has a MUCH bigger beam than ours 🙂 Our beam is about 12′, which makes for a pretty small space, but I love it so much. Like a little cabin floating on the water. That Bust Out Another Thousand is great – I’ll have to share with Tom. He still has much more he has to install (shade structure, solar, radar, communications system, etc), before we can even go out in the ocean, and all the restoration is almost going on 3 years. Insane! Yes, I hope we can meet one day on the water! This is truly awesome! Seems like such an exciting adventure. All the best on your sailing journey! Ha, I don’t know if I’ll start a Youtube channel! Love the photos! They are the ultimate motivation to continue blogging. Thanks for sharing! What an exciting change for you both. I’m looking forward to hearing more of your boating adventures. This is seriously one of my dreams, to live on a boat. But for now. I will have to live vicariously! I will follow along! So exciting Michelle! Your boat is beautiful. Did I read right that it has three washrooms? I’m interested to hear more about the watermaker. Yes, three bathrooms (two of them are quite small), and a watermaker. I think it’s great you are taking your dogs and I don’t know why people think you wouldn’t. A hundred years ago I lived on a fishing boat and we always took our dogs. We never had any problems and they loved it. Everyone used to laugh at me but they did have life vests. Spending time on the ocean was one of the most memorable parts of my life. Good luck to you both I hope you and the dogs have a great time. Thank you! The dogs are really liking it so far. They are quite adaptable. Wonderful stuff Michelle, congratulations on your new adventure! Oh and I wanted to mention a virtual mail service that we use called Virtual Mailbox. They take a picture of your mail (just the outside, like the envelope), so you see it digitally, then you decide if you want them to actually open and scan it, or you can have them simply delete it. You access it thru an app or from their website and get an email when “You’ve Got Mail!” We super love it and you may too! Here’s one tip for all of the hundreds that you’ve given to me and all of your readers. The mailbox company I belong to does what you mentioned 🙂 We don’t need a new company but, thank you, though! What a very amazing read. Must be a really wonderful experience. Tickled that you enjoy our blog, Michelle, thank you! Sing out if we can ever be a resource for you, we’re 100% sold on our life afloat. My dad has a Fountain Pujot Belize 43 catamaran that he keeps at Tresure Cay in the Bahamas. He lives in Dallas but spends at least 50% of his time sailing on the boat (he’s also a private pilot). He’s had his boat at treasure for 10 years now. Check our Treasure Cay and the Abacos when you head to the Bahamas. We absolutely love it in that area. Hope Town and Green Turtle Cay and Guana Cay are our favorites. Thanks! We’re so excited to go to the Bahamas. How cool! I can’t imagine how steep the learning curve is for piloting that boat! Wow! What a fascinating new adventure. Very exciting Michelle… and as always, you lay it all out in a way we can all enjoy. I can feel the sea breeze as I read your post. Congratulations on your new adventure, looking forward to following you guys – or should I say, sailors! I almost want to say I’m jealous of your life, but honestly, you’ve worked so hard for this and you deserve every adventure! I love reading about your RVing and Sailing adventures. How long do you think you will sail for? I love that you don’t have a schedule, that definitely makes everything so much more exciting! I’m not sure how long we will sail for. Somedays we say forever, and other days we are really craving a break haha. This is a great story. I wish that we could do the same adventures one day.But with 3 toddlers, it looks like it’ s gonna be a looooooong way before we gt there. As a yachtie who has spent years off and on with Fort Lauderdale as a base, I’m so pleased to see you finally living this dream. The Bahamas have a lot of beautiful places. You will love The Bahamas and New England by boat is so much fun! Thank you! We’re excited to explore the world! Funny! We started out sailing and then got an RV after 🙂 would love to compare notes sometime and let me know if you have questions about connectivity when you get to the Caribbean. My boyfriend and I worked/sailed the Caribbean for 5 months and learned (the hard way a few times) about staying connected. Funny! How are you liking RV life? Wow!!! We are not far behind you! We have a contract on a 2016 Leopard 44 and will be adding lots of upgrades as soon as we get her. We have 2 small dogs and one large that will be coming with us as well as we live aboard. I will be following you closely and hopefully we will meet somewhere fabulous on the seas!! Oh awesome! Where are you starting out of? My partner wants to live on a sailboat but I don’t know how to sail. Did you have prior real sailing experience before buying the boat? That is my biggest concern is having the knowledge what to do. I’ve seen some the sailing la vagabond videos and there is a lot to know about sailing for sure. I would definitely recommend taking at least a couple of classes and/or going on a weeklong charter (at the very least) to see if sailing is for you. On land. We walk them, just like we did with the RV. This really is a great post. It reminds us so much of our own journey. Unfortunately we are going to have to say goodbye to our Jeep soon — then again, it’s not a mean-machine like yours. We loved the layouts of the Lagoon 42… but then we found our Fountaine Pajot Eleuthera 60. Really, we can only echo everything you shared in this post. We’re not sure if BOAT should be revised to “Bust Out Another Ten-Thousand”. Hope to meet you on the water one day! We plan on heading to the Bahamas in just a couple of months. This looks like such an epic adventure! Thanks for sharing!! We love those vlogs too! They inspired us to get out there and start our own! We are now a few episodes in with more to come and have refit a used sailboat in the US to bring to Australia (currently in the Bahamas)! Follow us from the start 🙂 We are ‘How Not To Sail A Boat’ – love your blog!! Thanks! We’re in the Bahamas too (The Berries right now). Where are you at? Okay I read your blog about how you decided to live on a boat. So crazy but awesome. My husband and I did a crazy thing too where we sold our ranch in Redding California, kept another house we use as a rental in the same town and took the money we made off the ranch and bought a beautiful home here at the beach in San Carlos Mexico. The Sea of Cortez is literally down the street from us…and its stunning. It will be 3 years in May and we have not regretted it one moment. Since living here we have met numerous people who live on their boat in the marina and who came sailing through and loved this town so much they made it their home. So fascinating to learn about this lifestyle and I’m super tempted. My husband and I are 56/57 yrs of age and we are nervous about selling it all and buying a boat, I’m more incline to do it but not my husband. He doesn’t know anything about sailing. However, we live in a community that its all around us. I ‘m working on him. My husband works from home running his own business via online and I took an early retirement from the County. The cost of living here is 1/3 of what we initially spend in the States. We have no mortgage and it amazing how affordable it is to live here. So congrats on your next phase of adventures. I love reading about your life too…I may start a blog for sure and I’m reading all of your gems on how to do it. It’s just starting and what could I possible share that isn’t already being said by many others…ya know? 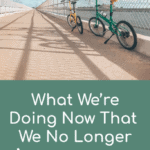 One book I just finished reading that was interesting was a couple who retired from military/government positions to sail around the world and their adventures…they live here now but just for fun you may read about them on their blog Julie Bradley. It’s not too well written but the content is fascinating because right out the gate they sailed into a category 10 storm and lived to tell about it. Among other challenges.